Maximum Rate of Fire 4 r.p.m. 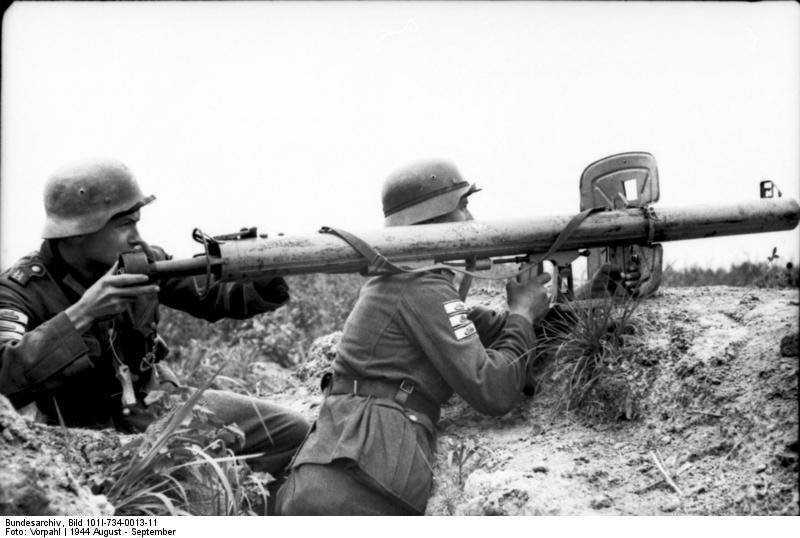 Notes The RPzB 43 was better known as the Panzerschreck and gave the German infantry a light anti-tank weapon that could deal with any enemy tank then in service. It was developed as a heavier version of the American Bazooka and like all recoilless weapons it left a large smoke trail caused by the back blast. It fired a 8.8cm hollow charged rocket compared with the smaller 6cm fired by the bazooka and was usually crewed by two men (Gunner and Loader). The first Raketenpanzerbuchse 43 reached the troops in October 1943 and was found to be an effective tank killer, but the gunner had to wear protective clothing to deal with the blast. Raketenpanzerbuchse 54 was developed as an improvement on the RPzB 43 and was fitted with a blast shield to protect the gunner. Better sights were also fitted and they was first issued in October 1944. The Panzerschreck was also used against pill boxes and bunkers.